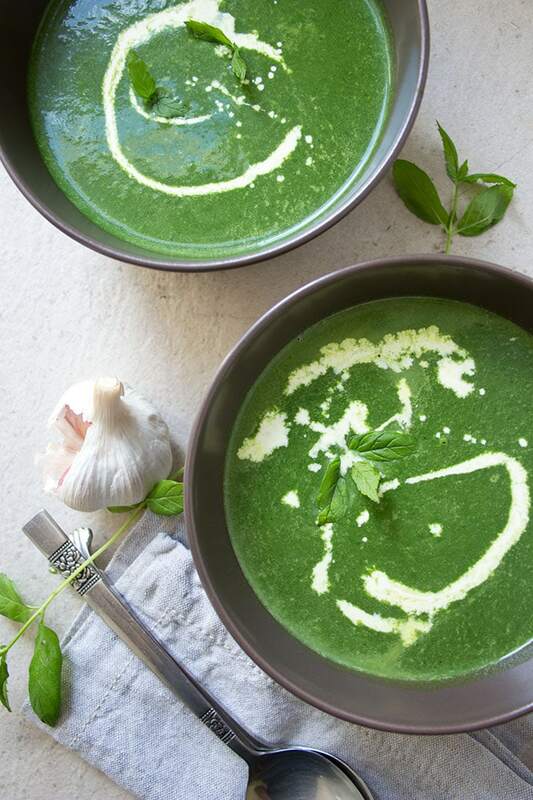 Cleansing, fresh and simple: This fragrant fresh spinach soup gets an added kick from mint leaves and the tangy, lemony spice sumac. Friends, I am so excited. I am now getting my vegetables delivered by a local farm. And you know what? They taste so FRESH! After the shock of the summer holiday being over it felt like a well-deserved treat. I am feeling quite smug about eating local, organic produce and about cooking with the seasons. We received, amongst other stuff, the crunchiest red peppers, some delicious looking carrots with a lot of earth stuck on them, a bunch of wondrous yellow beetroot and, on top of the lot, a huge bag with spinach leaves. it is just brilliant as a soup. 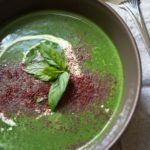 For this fresh spinach soup I paired the spinach with a big handful of mint, which makes it taste super fresh and fragrant. If you can get hold of it, sprinkle the lot with sumac. It’s a spice widely used in the Mediterranean and Middle East and has a tangy, lemony flavour with a smokey undertone that perfectly complements the freshness of the dish. This soup makes a perfect light lunch. We paired it with some homemade coconut cheese crackers (up next!) to get some grain free bulk. Add the mint leaves and blend with a stick blender or in a food processor until smooth. Serve with more cream drizzled on top and a pinch of sumac. Your photos are stunning! This looks delicious. This soup is such a beautiful color! Maybe my picky eater would eat it just because it is so vibrant! 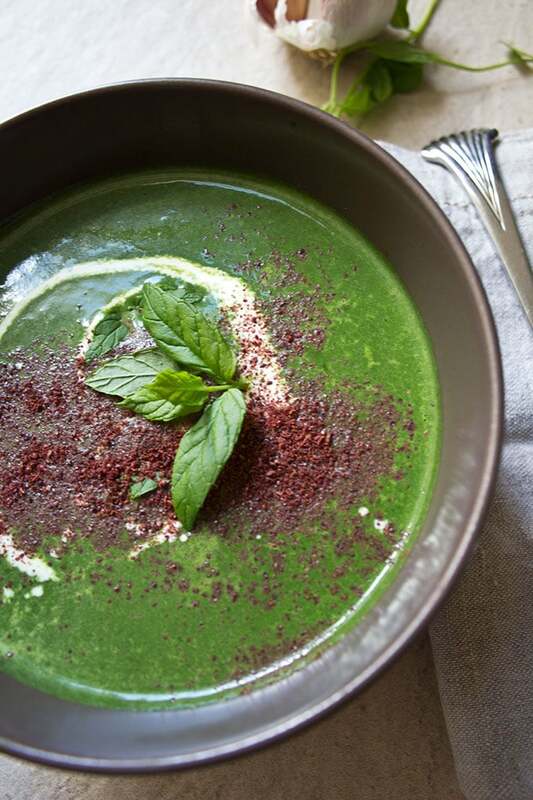 I love that you have sumac in this soup! A great spice that is rarely used! I’ve never tried sumac! And the soup looks seriously good.